Sometimes, it's not a simple walk on the beach at high tide in winter here on the Pacific. 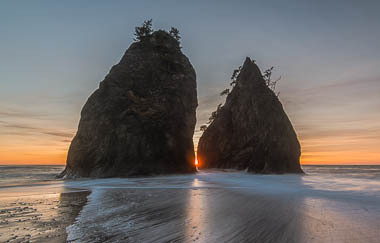 Thankfully the sun graced the skies for another day of exploration and photography, this day at Rialto Beach. 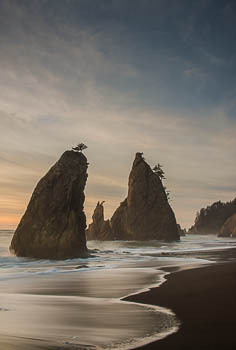 Rialto Beach, Olympic National Park, is just north of the Quileute Tribe's village and fishing harbor of La Push. 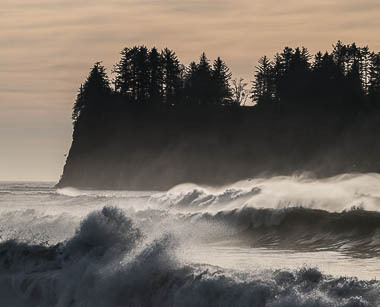 From Rialto Beach, there is nothing but wild beaches 40 miles north to Cape Flattery. 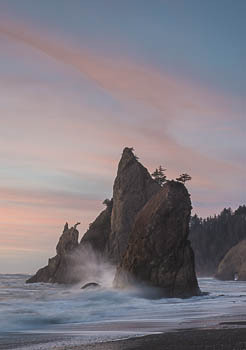 Rialto Beach consists primarily of stones of various sizes. The water is also quite deep close to shore, so the roar of crashing waves from the west, pounding and pushing massive amounts of stones, makes quite an intense and powerful sound. Waves were washing up into the huge debris field of driftwood. This is no ordinary driftwood, as many of the trees here were old growth beauties, now worn down, sometimes thrown on top of one another during the big storms and waves at high tide. It was high tide as I made my way dodging waves and driftwood to the sea stacks at the north end of the beach. The waves keep me close to the shore, but it was a pleasant, slow walk with just one creek to ford. Sunset was imminent as I approached the sea stacks. The walk back was gratefully easier, as more beach opened as the tide retreated. The light was quickly retreating as well. If I can see stars, the camera can capture many more. 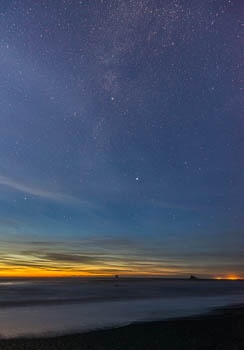 This time of year the summer Milky Way is in the WNW, with Cygnus pointing down to the horizon. A 30 second exposure captured the scene. In the far lower right, you can see the glow of crab boats as the crab season was just opened.